Over 2015/2016 Port Elizabeth businessman, Wayne Bolton, cycled 6000kms on a mountain bike over 21?2 months around South Africa connecting all 19 SANParks. He did this to raise awareness and funds for counter poaching initiatives. This year three generations of the Bolton family are once again embarking on an expedition called the OLLI (acronym for One Land Love It) Frontier Rhino Ride. Over July Wayne will cycle 2000kms connecting 20 private and provincial rhino bearing parks drawing attention to the conservation work that they are doing, paying tribute to the commitment of their rangers and raising funds for Care for Wild Africa (a rhino orphanage endorsed by SANParks and the largest in the world). 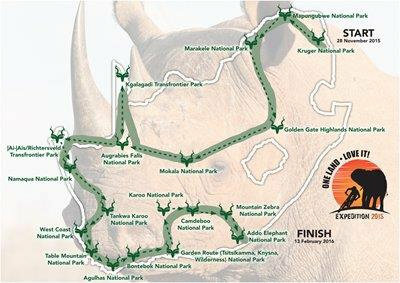 The OLLI Route in its entirety including last year’s expedition follows the outline of a rhino. The expedition starts in Port Elizabeth on 1 July and will continue through the Transkei into KZN, via Durban to finish on the Mozambique border. We will complete the last corner of South Africa drawing attention a frontier currently feeling the brutal impact of poaching. The 2017 One Land Love It Official Launch will take place on 28 June at the Sun Boardwalk (PE) with the Mayor Athol Trollip, Chairperson of ECPTA Vuyo Zitumane and Titus Chuene of NMBT along with other guests in attendance. They will also attach the first of a series of rings to Olli’s (a fibreglass rhino) horn. Olli will be towed throughout the expedition by our support vehicle which will be repeated at each of the parks connected with until the horn is covered in the colours of the South African flag – symbolising the reclaiming our natural heritage. A Headmaster, teachers, Brandon Booth and Melissa Farquhar (a student teacher and part of the Olli Team) will attach the second ring representing our youth and our OLLI #jointcustody Rhino School Challenge. The previous Scroll of Unity in Conservation was signed at each of the 19 SANParks National Parks and the new Scroll, which has already been signed by the Minister of Tourism, the Honourable Ms Tokozile Xasa will be added to by the Mayor and representatives of Tourism who will sign it at the launch. On the first day Wayne will connect 4 game parks being: Kragga Kamma, Addo Elephant National Park, Shamwari and Amakhala. The final park for Wayne’s is Tembe Elephant Park which he is expected to reach on the 31 July after which he will continue to the Mozambique border to plant a flag saying “close the gates”… a symbolic gesture with regard to the paucity of their borders.